What does end of support mean for you? 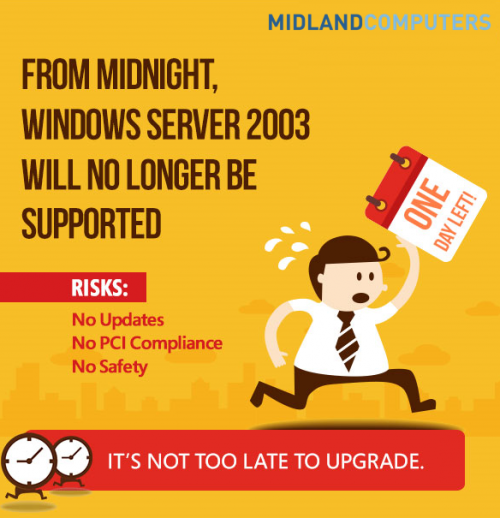 After July 14, Microsoft will no longer issue security updates for any version of Windows Server 2003. If you are still running Windows Server 2003 in your datacentre, you need to take steps now to plan and execute a migration strategy to protect your infrastructure. By migrating to Windows Server 2012 R2, Microsoft Azure or Office 365, you can achieve concrete benefits, including improved performance, reduced maintenance requirements, and increased agility and speed of response to the business. Contact us for the best solution for your business.